As you know that Aishwarya comes on time and tells Shiladitya everything and they make a plan. Shiladitya acts like unconscious to stop Angad to be king. They make a plan to kidnap Pranali so that they could make her queen. Today’s episode starts with:- Pranali’s father sats Angad to find Pranali through the waterway and also to command force. He tells him that Maling is an island and kidnapper definitely take her through the waterway as there is no other way. He tells him that they must keep an eye on both water and land to catch the kidnapper. Angad agrees and goes with Arag through the sea. The sainiks shoot arrows in all directions but they didn’t find any clue. In the midway Angad thinks that kidnapper can’t run enough fast so he will be definitely in maling and he plans to go back and he instructs Arag to find Pranali with force. There Pranali’s father was performing yagya for rajya abhishek and Pandits ask to call new king and Pranaali’s father says that now there will be the new queen of Maling and he brings Pranali. Pranali was so sad and tensed as she was not ready to take command of maling. Angad comes and thinks that there will be footprints of the kidnapper. He with his powers finds footprints and follows. There Pranali’s father was trying to console her to be queen but she was not ready as she was thinking that it will be a cheating with Angad. He says that no there is nothing like that and tells her that its urgent so please took command of maling and be queen. However, he consoles her and his wives. Then the process of rajya abhishek starts and Pranali starts taking bows to be an honest and loyal queen of Maling. Angad was following footprints and he sees a rope tied with balcony. Then he follows that. At last, he goes to his mother and she asks him that is he knows about where is Pranali and he answers that he knew that she is in secret room. Then she asks that is he also known about it that what are they doing there and then she tells him about Pranali’s rajya abhishek. Angad gets angry and goes to stop. But she consoles him that to get Maling they must not take the help of violence. Angad doesn’t understand and to cooldown himself, he starts breaking things. There Pranali’s father took the crown and goes to keep it on Pranali’s head. Now what will happen in Mayavi Maling ? will Angad stop it or Pranali will be the queen of Maling? To know it stay tuned with us. As you are known that Aishwarya comes on time and tells Shiladitya everything and they make a plan. Shiladitya acts like unconscious to stop Angad to be king. 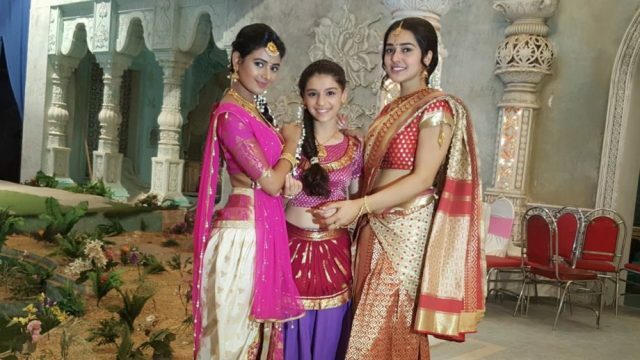 They make a plan to kidnap Pranali so that they could make her queen.